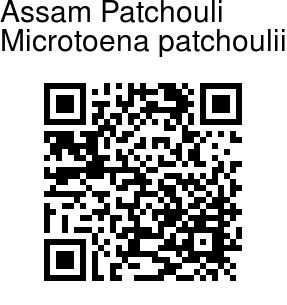 Assam Patchouli is a herbs 1-2 m tall, with spreading hairs, velvety, base somewhat woody, much branched. Stalks of stem leaves are 1.5-4 cm, blade usually triangular-ovate, 2.5-9 × 2-7.5 cm, bristly, densely so below on veins, base broadly wedge-shaped to heart-shaped, margin coarsely toothed, tip pointed. Flowers are borne in 1-sided cymes in leaf axils or in panicles at branch ends. 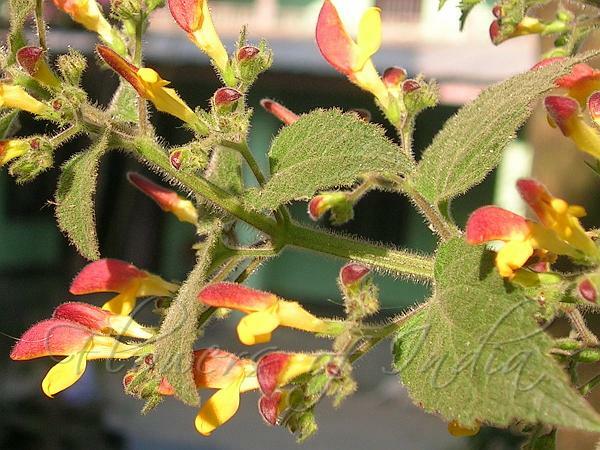 Floral leaves are 0.8-2.1 x 0.3-1.5 cm, gradually reduced toward stem end, bracts linear, about 2-3 mm. Sepal cup is about 3 x 1.7 mm, densely glandular velvety and hairy, teeth subequal, lanceolate, to as long as calyx. Fruiting calyx is dilated, conspicuously netted. Flower are about 1.5 cm, hairless, mouth about 3 mm wide. Upper lip are purple or brown, about 7 mm, base flat, tip notched. Lower lip is oblong, middle lobe narrowly ligulate, about 0.7 x 0.4 mm; lateral lobes ovate, about 2 mm wide. Nutlets are black-brown, triquetrous, ovoid, about 1.6 x 1.3 mm, smooth. Assam Patchouli is found in forests, open grassy slopes in NE India, China and Myanmar, at altitudes of 1100-2000 m. Flowering: October-February. Medicinal uses: Assam Patchouli is an aromatic herb used for coughs, asthma, abdominal pain, and enteritis.